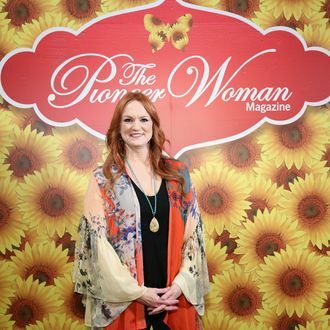 If you’re into food, it’s become almost impossible these days to escape the Pioneer Woman, the homespun Food Network personality who cooks “Chicken Enchilasagna” and blogs about her Green Acres–y transition “from city girl to domestic country wife.” Now, no one’s ever accused Ree Drummond of being poor — she’s one of the network’s top-rated stars, sells branded home furnishings at Walmart, and even has a monthly magazine published by Hearst — but an overlooked detail about how not-poor she is has emerged thanks to a new report. She’s actually the 23rd-largest landowner in the United States. According to the annual Land Report, her family reportedly owns 433,000 acres in Oklahoma, more than half as much land as Texas’s King Ranch, a place so famous there’s a $60,000 Ford Expedition named after it. While not an overnight development, especially in the Drummond’s hometown of Turkey (no, seriously) where they’re the second-largest employer, the Daily Mail seems to be the one that discovered her acreage in the 2016 report. The paper did some additional digging to see what that translates to financially. Unsurprisingly, it seems the Drummonds are raking it in, and a main source of income is the U.S. government. Since 2006, the Bureau of Land Management has reportedly paid them $24 million worth of subsidies to “support animal protection” by allowing wild horses and burros to roam on their land. This vast swath of Drummond-owned countryside is hard to comprehend. It represents nearly 1 percent of Oklahoma and is equivalent to about half of Rhode Island, which at least makes those times the Pioneer Woman has extolled the virtues of thrifty Mason jars way funnier.